Fig. 1 illustrates a contact with the right hand in a firm grip on the heel bone, with the thumb above and the index finger below. The left hand is on the occiput and atlas area. Top and bottom are being balanced. Both are weak spots & need release often. Fig. 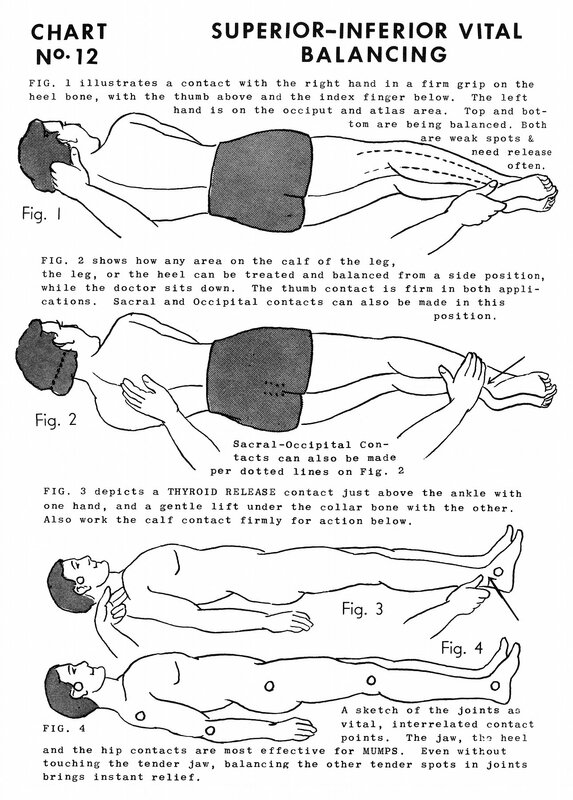 2 shows how any area on the calf of the leg, the leg, or the heel can be treated and balanced from a side position, while the doctor sits down. The thumb contact is firm in both applications. Sacral and occipital contacts can also be made in this position. Fig. 3 depicts a thyroid release contact just above the ankle with one hand, and a gentle lift under the collar bone with the other. Also work the calf contact firmly for action below. A sketch of the joints as vital, interrelated contact points. The jaw, the heel and the hip contacts are most effective for mumps. Even without touching the tender jaw, balancing the other tender spots in joints brings instant relief.